When Nintendo announced that the Nintendo Switch Pro Controller, I wasn’t sure what to expect. Part of me thought that we’d get a controller that was made out of leftover and unsold Wii U Pro Controller parts. While the other part was hopeful that we’d get something to use other than the Joy-Con’s. So what exactly did we end up with? An amazing controller, that’s what. To me, easily one of the better controllers that have come from the Nintendo camp. Throughout gaming history, Nintendo definitely has had its ups and downs when it comes to hardware. Mind you we’re talking accessories, not actually systems. Nintendo has have created several amazing controllers through history. The NES Max, NES Advantage, Wavebird, Wii U Pro Controller, all come to mind. I’ve owned each of the aforementioned controllers and loved them. That said, the Nintendo Switch Pro Controller has been added to that list. This is no easy feat as I’m a hardware snob and if something isn’t just right, I’ll tolerate it but it won’t be something I’m eager to recommend. Or in the case of a controller, reach for. That’s not the case here. Unlike so many other non-Nintendo controllers, the Pro controller simply fits into my hands. The ergonomics are fantastic and the controller seamlessly sits in my hands during long game sessions. During my 30 hours of playing The Legend of Zelda: Breath of the Wild, I’ve never had my hands feel tired, or have my gameplay interrupted. This isn’t something I can say about many other controllers. It’s clear that Nintendo spent some time researching what worked and what didn’t for.less. I do wish that the controller was a tad heavier, as it doesn’t feel as heavy as the Wii U Pro controller. Still, it’s definitely a fantastic controller and one that every Switch owner should own. The only bad thing about it is the fact that they’re so darned hard to come by. Every store so far has shared the same fate as the Nintendo Switch; they’re sold out and no one knows when they’ll get any more. At the time of this review, I could not find any location that had any in stock. Outside of eBay that is. Featured on the face of the Pro Controller are the ABXY buttons, which are profound and decently sized. There’ not so large that they take up much space or don’t leave enough space between them. They do suffer the same fate that many gamepads do, the buttons are a bit mushy. That’s just the nature of the technology used and it’s definitely not something that many are going to notice. Yet alone complain about. It’s just an observation on my part. The top of the controller includes a shoulder and bumper trigger on both sides. They also similar to the front-facing buttons, a bit mushy and I’d rather those being actual switches. I enjoy controllers that provide an audible click when they’re pressed. As with most controllers, the Pro controller also includes two analog sticks, both of which were very comfortable and responsive. There wasn’t any play with either of them and they snapped back into the center when not in use. I would have liked a bit more cushion on the top of the controller. The d-pad is also exceptional, though to be quite honest, I haven’t used it much as most of the games I’ve played didn’t require it. I expect the d-pad to get more use one Ultra Street Fighter II is released later on for the Nintendo Switch. In fact, I’ll add that using the Joy-Cons for any game that requires a true d-pad is going to be a chore. Mainly because they don’t use an actual d-pad and instead Nintendo opted for directional buttons. Gone are the select/start buttons, as they’ve been replaced by the + (plus) and – (minus) buttons. The placement of these buttons is somewhat similar to the DualShock 4 controller, being spaced about 1.5 inches apart from each other on opposite sides of the Nintendo Switch logo. This is great as it means you won’t function to hit either of them during gameplay. Sitting below them are the home/snapshot button. The home button acts like you expect it to, it takes you back to the Nintendo Switch home screen. The Pro Controller also houses an NFC reader that sits in the middle, under the Nintendo Switch logo. This can be used for amiibo functionality. There isn’t anything special with this and it works just as it should. It’s worth noting that The Legend of Zelda: Breath of the Wild does take advantage of this. If you didn’t know already. As with any wireless controller, both the battery life and range are important. 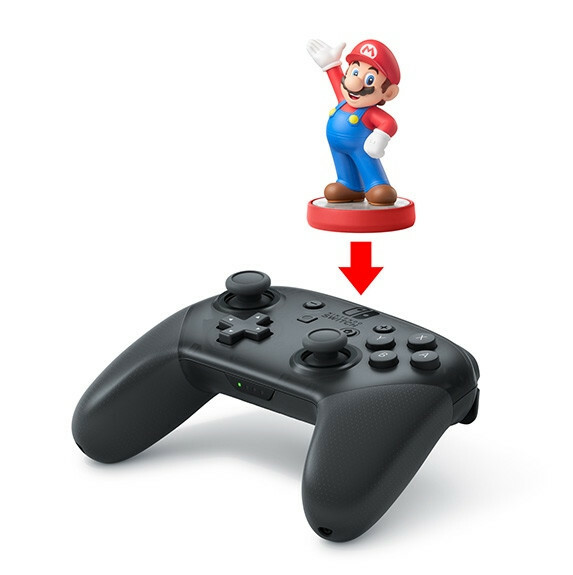 The controller is charged via a USB type C connection, which can be done via the pack in cable or the same one provided with the Nintendo Switch dock. You can also use a USB AC adaptor and USB type C cable as well, should you choose to. Once the controller is charged, the battery life is impressive. I’ve gone anywhere from 25-30 hours off a single charge. I don’t have to state how great that is, especially for those late night gaming sessions. I’d love to know what rating (mAh) battery the controller is packing. Though as much as I’ve looked, I’ve yet to find out. I’ve emailed Nintendo to see if they’ll share those with us. And no, I will not be taking apart my controller to find out. Update: The battery is a simple 1300mAh battery. It sort of look likes a cell phone battery. On the range/distance front, I’ve tested as far as 15 to 20 feet away and had zero issues with playing on the controller. I even tested by moving to an adjacent room and was still able to continue playing, as reported by my helpers. I don’t imagine that many people will play that far away but it’s nice to see that if you wanted to, you could. The HD rumble, on the other hand, isn’t something I’ve enjoyed so far. While the rumble support is appreciated, it feels cheap to me. The rumble effect is a bit weak, yet it does accomplish what it’s set out to do. Perhaps it’s because I’ve been spoiled with more expensive controllers. Since the controller uses Bluetooth, you’re able to use this on the PC as well. I’ve tested this out and it’s on par with other Bluetooth controllers. I’m actually having a hard time deciding on using this for my exclusive PC controller now and I own an Xbox One Elite controller. It’s that good. If you do decide to try it on the PC, keep in mind that it only works with DirectInput. There is no PC Xinput support and I don’t think Nintendo is going to work that out. It’s not aimed at the PC. That said, I expect to see someone iron out a solution so that you won’t have to jump through numerous steps to get it to work with all your favorite PC games. If there was something I’d change, would be to put the indicator light on either the top of the controller or on the front. Perhaps under the d-pad and right analog stick. I’d also like if there was a headphone jack on the controller. Nintendo could possibly charge $10 dollars less. as well. Other than that, I feel that Nintendo has another winner with the Nintendo Switch Pro Controller. After playing with this, I’ve yet to go back to the Joy-Cons for either Zelda or Fast RMX, and that should say something. There’s not much to say here. 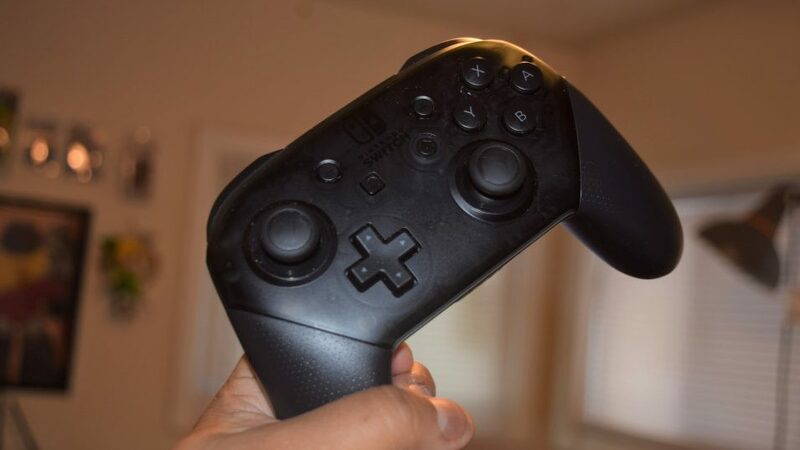 The Nintendo SwitchPro Controller is easily the best controller you can have for the console. It fits your hands, super comfortable, has a decent battery life and does everything the Joy-Cons do. The negative going for the controller is the lackluster HD rumble and the availability of the controller. You simply can’t find it anywhere, but hopefully, Nintendo corrects that issue so. Sure it costs $70 at the time of the review, but it’s definitely worth it.